Ambrosia Apples are great for baking – they become meltingly soft without getting mushy or losing their shape. This tart is a spin on a classic apple pie. I’ve added aged cheddar to the crust, giving it a nice savouriness which works well with the sweet, crisp Ambrosia Apples. You can make individual tarts or one large one. Either way your guests are going to be coming back for seconds! For the dough: Combine the flour, salt and sugar in the bowl of a food processor. Turn the machine on and pulse to combine the dry ingredients well. Add the cheese and butter to the machine. Pulse the mixture until the cheese and butter are in pea sized pieces and the mixture resembles very coarse crumbs. Add the ice cold water and mix for 10-15 seconds until combined (do not over mix). Place the mixture into a large bowl. Using your hands, press the dough together until it forms a ball. Once the mixture has come together, remove from the bowl and wrap tightly in plastic wrap. Place in the refrigerator for at least 1.5 hours and up to 3 days. For the caramel sauce: In a medium saucepot, combine the water and sugar. Place on medium heat. Do not stir. Once the mixture comes to a boil it will begin to reduce. Do not stir with a whisk or a spoon as the mixture will crystalize. Once most of the water has evaporated, the sugar syrup will begin to turn brown. Once the sugar syrup becomes dark, golden brown, remove from the heat and add the cream and salt. Whisk the sugar and cream mixture until well combined. Cool slightly in the pot and then transfer to a plastic container with a tight fitting lid. Place in the refrigerator until ready to use. For the filling: Combine all of the ingredients in a bowl and mix well until the apples are well coated with the sugar, flour and cinnamon. To assemble the tarts: Preheat the oven to 425 degrees. Remove dough from the refrigerator. On a lightly-floured surface, roll out the dough until it is 1/8” thick. Cut out a 7” diameter circle from the dough. Repeat until you have 6 circles of dough. Place the circles on a parchment lined baking sheet. 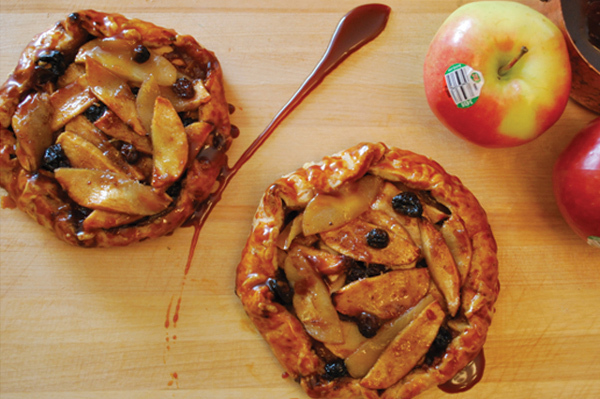 Divide the apple mixture among the circles of dough, placing the mixture in the center, leaving a ½” border of dough. Reserve the remaining liquid. Gently fold the dough edges toward the center, slightly overlapping the apple mixture. Repeat until all the tarts are complete. Place in the oven for 15 minutes. Remove from the oven and spoon the reserved liquid over the apples. Reduce the temperature to 350 degrees, and bake for another 20-25 minutes, until the crust is golden brown. Remove the tarts from the oven and cool for at least 15 minutes. To Serve: Heat caramel sauce in the microwave. Place the tarts on dessert plates. Drizzle caramel sauce over and around the tarts. Serve with ice cream or whipped cream if desired.